My encounter with Abstract Void's Into the Blue was the result of a random Bandcamp foray, but it's interesting. A roughly 70-30 split of synthwave and post-black metal, Into the Blue puts together melancholic synth tunes with black metal vocals and guitars, yielding an odd, retro-futuristic sound: The early 80s' vision of what we'd all be listening to someday, combined with a style we actually did end up hearing. The songs all start off with pure synth, running to a bouncy mid-tempo 80s dance beat with lots of little keyboard arpeggios. As the song progresses, tremolo picking shows up and starts harmonizing with all the warm synths that get layered on, and the vocals start up. They're the weakest aspect of what the guy behind the band (this is a one-man project) is trying to do; with absolutely no power to them, they gasp and hiss behind the rest of the instruments, which are all mixed more prominently. But they blend into the overall sound quickly and the listener can then forget about them. The guitars, on the other hand, fare much better, though the constant emphasis on making the synthesizers sound as light and fluffy as possible means that the guitars don't get to lay down a lot of heavy chords to bring things down to earth. 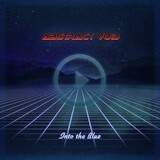 Abstract Void's mantra is clearly to get the synthwave part right first, then worry about everything else later. Of course, this being a metal review site, it's hard to approve of that mentality; sure, the synth is nice, but couldn't he make this just a wee bit heavier? Nonetheless, some of the songs have more metal elements than others. An Euphoric Dream's tremolo harmonies with the 80s-style synth come off especially nicely, and It's Not the End also does well, providing some much-needed lows to counterbalance the highs. Despite the packaging, the synthwave fans will probably like this more than the metal fans, but it's a sturdy, well-made little album that is good for a spin or two.